Five years after a tragic mass shooting, some college students at a University of California campus want to ban armed police officers. 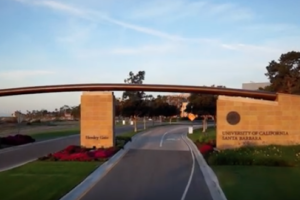 The University of California-Santa Barbara is looking to hire a new LGBT coordinator to promote its LGBT Center and activities, which could pay $57,000 a year. After ten hours of discussion and disagreement, UC-Santa Barbara student senators walked out a meeting on whether to pass a boycott-Israel resolution or not to. A professor is fine with having taxpayers pay for illegal immigrants’ tuition. Are you okay with that? Some of the chalk writing on sidewalks were hateful and offensive, in the defense of UCSB’s investigation. Satire is lost on these grad students at California-Santa Barbara, huh? Whistling makes the list of what constitutes sexual assault at the University of California-Santa Barbara.